I especially like flowers that bloom in winter. This hellebore was blooming today. Sorry for those of you who are in the nasty cold. What a name- polar vortex! That’s nice to see. Even if we are not yet getting the the full blast of winter it brightens up these dark, chilly winter evenings. Very delicate flower and nicely photographed. 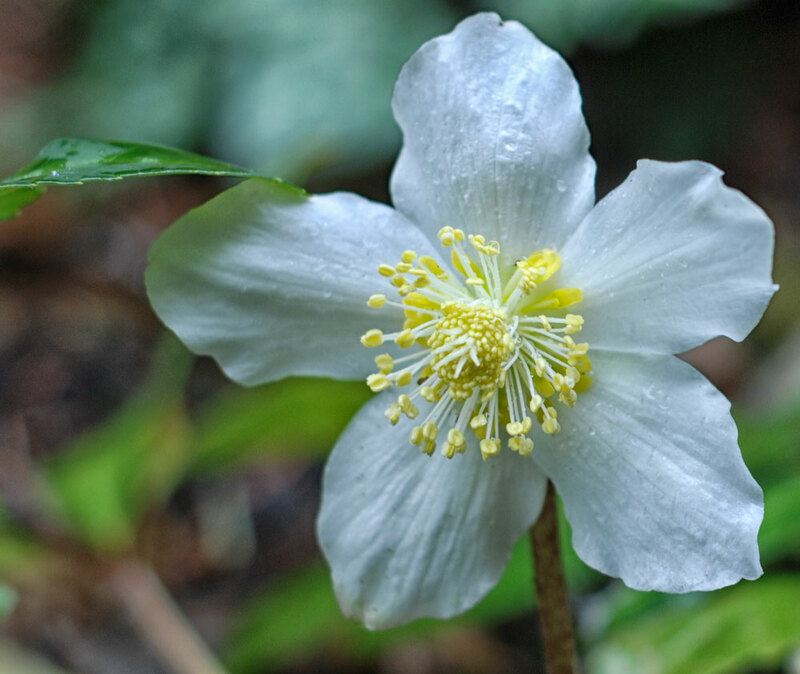 Hellebore poisoning is what is thought to have killed off Alexander the Great, so don’t go nibbling it! So much for the Polar Vortex! Love the papery looking petals. Good to see you back! Beautiful picture with outstanding details. I think that y’all missed the cold entirely, didn’t you? Beautiful capture, especially with the water droplets. We really miss the flowers in the winter, but there are some great greenhouses nearby. Hmmm.. time for a visit. It’s always nice to see signs of plant life when we’re in the midst of winter in the midwest. Where do you have flowers blooming? The detail is exquisite. Nice to see a sneak preview of what is to come in a few months here. And a lovely photo and song too. How lovely to have outside flowers this time of year and you don’t even live in the tropics! I’ve always been curious if hellebores would survive in our Dakota weather but never tried them. They always seem to be coming up with new terms to describe the weather…and now they are naming the major winter storms too. Now I think we are all moving in with YOU! 🙂 What a gorgeous bloom! Beautiful white bloom, and much better than the white snow we have covering our gardens. So beautiful! Enjoy it extra for me. Beautiful and a refreshing change from our outdoor offerings at this time of year. Happy New Year!